I wasn't allowed to watch 'My So Called Life', but I wanted their clothes. When people say 'ten years ago', I assume that means 1997. But now 10 years ago is the 2000s. Just another reminder that I am getting older. As I was in bed last night, I began thinking about the 90s. The good old days when times were simpler and Clarissa really could explain it all. 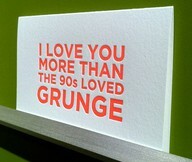 Not only that, but there were bad makeup colors, cropped tops, guys who bleached their hair tips yellow...oh, dear. Since I couldn't sleep (perhaps the horror of remembering bleached tips and puka shell necklaces?) I made a list of things I said in the 90s. Enjoy! That's dope - an entire generation refering to something 'cool' as being a narcotic. What was wrong with us? Didn't we take D.A.R.E. in elementary school? Ugh! I forgot to rewind the video! Remember when Blockbuster had those posters in their stores saying 'Be Kind. Rewind.' ? I still forgot. Aiight If we needed a shorter version of 'Alright' why didn't we just say 'ok'? I want a love like Cory & Topanga. This couple from Boy Meets World was one of the most iconic of the 90s. Until Ross & Rachel came along. All that & a bag of chips! See, we didn't really think this one through. Chips are cheap, full of fat, and found in vending machines. Why is that a compliment? I need a new CD player. Mine keeps skipping. Most likely the result of my dropping it a lot. Talk to the hand! So. Stupid. Whoops! I forgot to feed my Tamagotchi. Sorry I missed your call! My brother was on the internet. Kids today will never understand the tension that comes from wanting to play Oregon Trail on the internet & having to get off because someone needs to use the phone. I am sure this has jogged your memory. I'd love to hear your additions!! !